TOUCHING notes - left in memory of Savita Halappanavar - will be sent to her parents as a reminder of her place in Irish history as the public voted to repeal the eighth amendment. The notes, alongside a mural of Ms Halappanavar, were removed today from a space outside the Bernard Shaw pub in Dublin. Dublin City Library commissioned a photographer to make digital copies of each note. It is now planned that the notes will be digitised and available to future generations within library archives. However, the originals will be sent to the dentist’s father, Andanappa and mother, Akhmedevi Yalagi, in Karnataka, south west India. The 31-year-old, who died from sepsis at Galway University Hospital on October 28, 2012, became the face for the abortion rights campaign after she died after being refused a termination. The mural, by Dublin artist Aches, was taken down yesterday by Together For Yes campaigners, along with the notes. Ms Halappanavar’s parents had become instrumental in the final push to repeal the eighth amendment, appealing to the Irish public to vote to remove the law. The dentist’s father has even suggested the legislation that will allow women to access a termination legally in Ireland, be named ‘Savita’s law,’ in her memory. Ailbhe Smyth, from Together For Yes, told Independent.ie Ms Halappanavar’s name and memory should be remembered in Irish history with a suitable home for the mural but she also suggested the Government consider naming a public building after her. 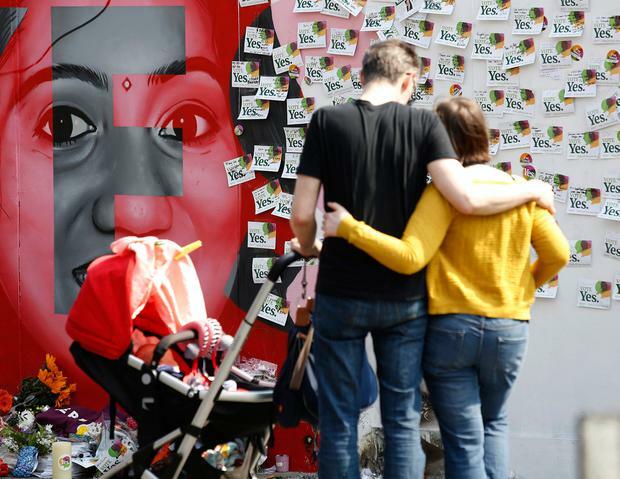 “If the eighth amendment hadn’t been in existence, we would not have lost Savita,” Ms Smyth said. “It’s right we honour her and a very important moment in our history, when the whole nation came to the tragic awareness that this was a death that should not have happened and that it was in our hands to prevent further deaths happening. Ms Smyth, who was prominent in the campaign and had for many years protested against Ireland’s abortion law, said it had been “particularly touching” to see the outpouring of affection from the public, who’d left notes and lit candles in Ms Halappanavar’s memory at her mural. It has been estimated that 1,200 cards had been left on the memorial site. It’s now planned that these messages will be catalogued and added to the library’s online digital collections, to provide information for future generations on a historic period. The chair of the inquiry into Ms Halappavanar’s death said the eighth amendment had played a major role in her death. The finer details of the archiving project are yet to be arranged with Together For Yes.